Want internal SATA speed without having to pry open your computer? Well, it will cost you, but Akitio’s $400 Thunder3 Duo Pro external RAID enclosure (which you can find for $353 on Amazon) will do the trick and then some. With two drive bays, and the ability to function in RAID 0 (fast/striped), RAID 1 (safe/mirrored), SPAN (concatenated storage), and as two separate disks, the enclosure is also quite versatile. Unlike its cousin, the spectacularly fast Thunder3 PCIe SSD, the Duo Pro is low-profile. That is, it orients its dual bays horizontally. As the unit is capable of housing 3.5-inch hard drives, the wide stance is lot safer. If you’ve never knocked over a drive enclosure while drives are spinning... Err, let’s just say the event tends to be bad for the drives—and your data. The styling of the Thunder3 series, including the Duo Pro, is reminiscent of the Macs of a few years ago. That’s a good thing in terms of looks, but a bit odd since OS X and Macs don’t support Thunderbolt 3. Regardless, the silver-with-perforated-metal shell is okay in my book. I wish some of my NAS boxes were as attractive. The wide stance makes the Akition Thunder3 Duo Pro safer when you utilize hard drives. The back of the Duo Pro is home to two Thunderbolt 3 ports (not to be confused with USB 3.1 which also uses a Type C connector), a DisplayPort 1.1 port, and a dedicated USB 3.1 (older 5Mbps) Type B port. Yes, USB 3.x is confusing. There’s also an AC jack as there’s no way to run two hard drives or SSDs off of bus power alone. Also on the back is a small rotary switch to set the box’s RAID, or non-RAID, mode. Inside is Intel’s Alpine Ridge controller. While that chip supports DisplayPort 1.2, Akitio informed me that its had issues with some 1.2 displays, so support is limited to DP 1.1. Kudos for honesty—not something we see out of every company. You can put your display in DP 1.1 mode and it will work fine running off of Akitio’s Thunder3 series enclosures. Adding drives is super simple. Unscrew the two large, captive thumbscrews on the back of the box, slide the cover off, slide the drives in, and screw them down with the same type of captive thumb screws. It’s the slickest, neatest, easiest system I’ve come across, and I’ve seen more than a few. Once I was used to it, I could swap out a pair of drives in a little over two minutes. Excellent design job, Akitio. There’s little to no difference between an internal SATA RAID setup and the Thunder3 Duo Pro in terms of performance. We tested the unit with both hard drives (albeit ancient ones) and two OCZ Vector 180 MLC SSDs. 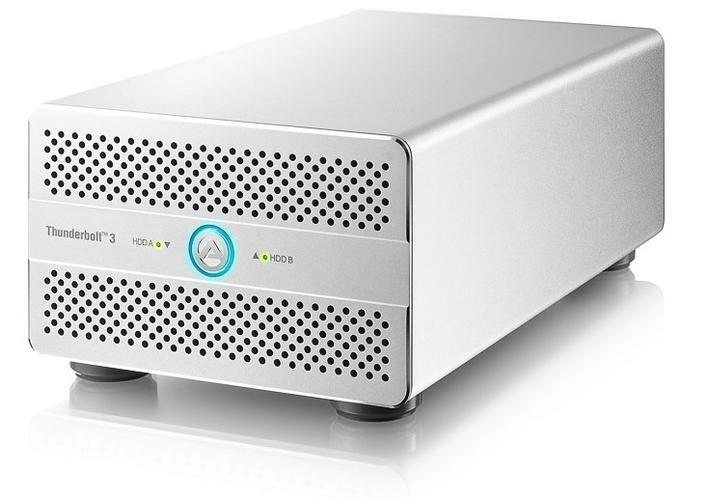 The Akitio Thunder3 Duo Pro is the fastest external SATA enclosure we’ve tested to date. With our two antiquated platter spinners, we saw around 250MBps reading and 150MBps writing. We’re pretty sure you could do a lot better with modern drives such as the Seagate Barracuda 10TB. But any hard drive is a complete waste of Thunderbolt 3’s bandwidth. What you really want to use are SSDs. With those in place, we saw 750MBps reading and 660MBps writing—a lot more like it, though still far less than what Thunderbolt 3 is capable of. 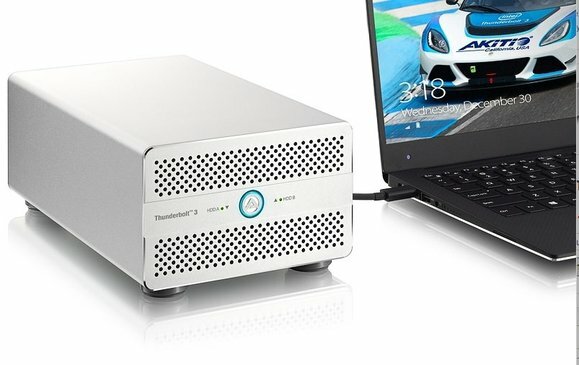 The Thunder3 Duo Pro easily bested Atech Flash’s 3.1 enclosure, and walloped Seagate’s USB 3.0 Backup Plus Fast, though both those products are considerably cheaper. Note that we used an Asus X99 Extreme motherboard and Asus Thunderex 3 expansion card for testing. We didn’t test the box via USB 3.1 (older Gen 1 5Mbps), but it would obviously perform slower. The unit is far too pricey to buy for use with the older technology—USB is included simply for compatibility. Note that in addition to not being compatible with OS X and the Mac, you can’t boot from the Thunder3 Duo Pro. As much as I like the Thunder3 Duo Pro, it’s both expensive and technological overkill. 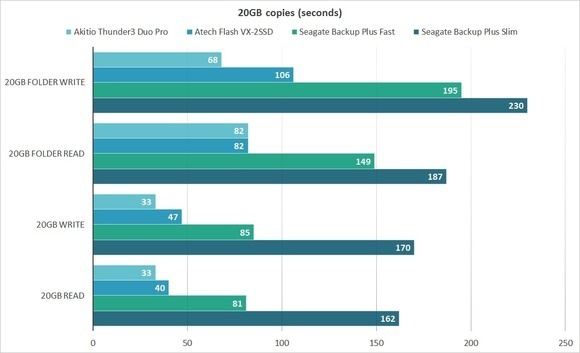 There’s no way SATA drives, especially those that rely on spinning disks, will significantly dent the bandwidth offered by Thunderbolt 3. You can go just as fast for a lot less cash with something like Atech Flash’s USB 3.1 (10Mbps) VX-2SSD. 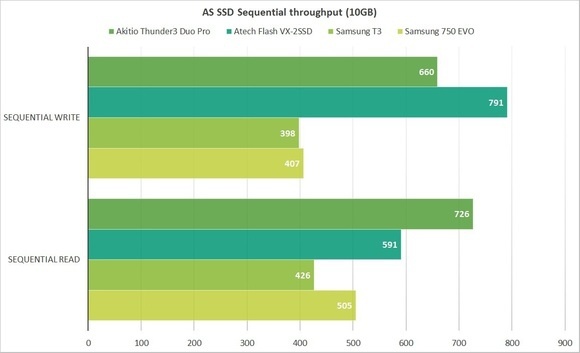 However, at least with a pair of SSDs, the Thunder3 Duo Pro leaves no doubt that you’re getting just about the best SATA RAID performance possible. And, you get a DisplayPort port, good looks, as well as the fastest screw-down mounting system in existence. If the price doesn’t bother you, have at it.